What does it take to respond to violence against women and girls in armed conflict in a holistic way that acknowledges women’s own agency to heal, and assures that rights to health, justice and are met? The Rwanda Women’s Network an AIR Steering Committee member, documents their experiences of responding to the Rwandan genocide of 1994 and the establishment of the groundbreaking Polyclinic of Hope. 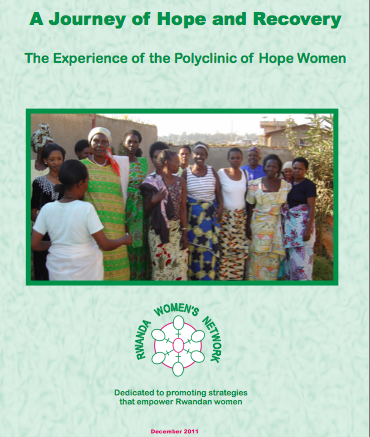 The RWN under the PoH [Polyclinic of Hope] program emphasized a holistic approach towards addressing the health needs of the women through socio-economic, legal, and human rights empowerment. For RWN it is not merely a responsibility to protect, but to empower women to their own dignity and protection, as it strives to reach out to victims and survivors of SGBV locally and regionally. A Journey of Recovery: The Experience of the Polyclinic of Hope Women was produced as part of AIR’s Generate and Build programming. Read the full text of in the AIR Resource Library here.